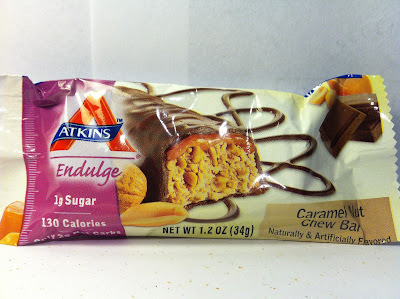 It has been a while since I've reviewed an Atkins product on the blog, because frankly, most times I find their products too expensive. So, when I saw a free giveaway online where they were giving away a "starter kit" as it related to their general weight loss plan, I hopped in and signed up and they sent me a trio of sample bars. 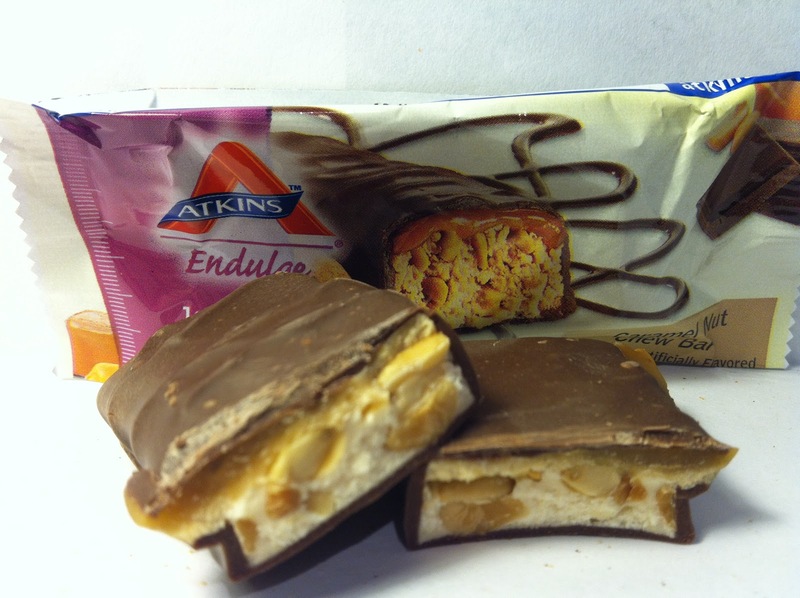 You'll be seeing reviews of all these bars on the blog, but for the purposes of this review, we'll start with a bar from the "Endulge" line of bars with the Caramel Nut Chew bar. I would assume "Endulge" means that this is a bar where you can break your strict adherence to your diet for the occasional treat just so that you don't go batty. This bar comes in at 1.2 ounces and is 130 calories and has five grams of protein, by the way. As you can see from the picture, this bar is taking the Endulge factor to the highest degree, because they are truly making a candy bar out of this and I'm fine with that. This bar has a nougat interior that is oozing with plentiful caramel and a fairly liberal spreading of small peanut pieces throughout. The bar is then coated with a hard chocolate layer and if you really wanted to de-construct this, you could say that it looks a lot like a Snickers bar. One thing to not is that this bar has a lot of caramel as not only was there plenty inside of the bar, but there was so much that it was creeping its way out of the bar too. For a big caramel guy like me, seeing the caramel everywhere was very visually appetizing. The visually appetizing aspects carried over into my first bit of this bar too because it was incredible delicious. The nougat interior was chewy and moderately sweet, but the addition of the peanuts brought in a nice crunch when you encountered them. The caramel, while not overly sweet, add a nice gooey factor to the bar and when you matched the gooey factor, the chewy factor and the crunchy factor, this bar was a winner in itself. To top that all off, the chocolate coating was semi-sweet and extremely thick and added a nice balance to the interior mix. It tasted like a Snickers bar and all in all, this bar was a winner. Buy It or Fly By It? Clearly I'm going to give this delicious bar a BUY IT rating. I don't know how much it costs regularly in the store, but if you are going to "endulge" on something, you should definitely do it with this bar because this is about as tasty as you can get. The thing about this is that I'm not sure it's a good product to help you watch your weight because I could see myself, or anyone for that matter, eating about a million of these things consecutively because they are that good. these are my favorite Atkins bars. They are setting the taste bar pretty high with an elaborately tasty name like ""endulge." I am worried my expectations would be too high.